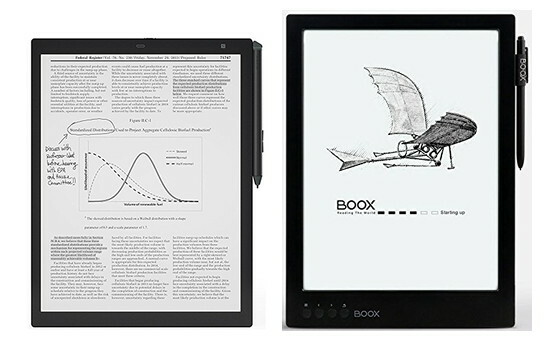 In a battle between two 13.3-inch ereaders with E Ink Carta displays, the Onyx Boox Max Carta and Sony DPT-RP1 are currently selling for the same price (except the Max can be had for even less). The Max Carta has been going for $750 lately (and it still is on Amazon) but Banggood has it marked down by $50. Plus you can get an additional 9% off with coupon code 11annv9% to take the price down to $636 USD with free shipping. The Sony DPT-RP1 isn’t on sale but it’s finally for sale and shipping now from B&H after being on backorder most of the time since its release in June. Amazon hasn’t quite caught up with orders yet; their listing for the Sony DPT-RP1 says it will be in stock on August 30th. But that’s an upgrade over saying it will ship in the next 1 to 2 months as was previously stated. It’s interesting how new E Ink ereaders are often backordered for the first few months after their initial release. It was the same the Kobo Aura One and a number of Kindles. Considering the limited availability up until this point, I wouldn’t expect the Sony DPT-RP1 to go on sale anytime soon, but it’s good to see the Onyx Boox Max drop to a lower price at the same time the Sony comes back in stock again to help drive competition between the two brands. The onyx boox max is a buggy piece of trash, anything above 400 is a complete joke. Thank you for information about coupons. Man, the Sony looks awesome! Yeah — I get it 13″ readers are still priced for businesses. If Sony ever gets a 13″ e-reader down to ~$250 I’ll be one of the first in line. I got the Sony off backorder recently. The tips wear out very quickly but I haven’t read this much in months (technical papers for work). I find it better than paper. Hopefully in another update you’ll be able to easily move around text you’ve written but the side-by-side feature (of a paper and notes, or of the same notes/paper) is magical. It’s incredibly expensive and I wouldn’t go broke buying it, but if a big part of your job/day is reading things on PDFs, it pays for itself. It doesn’t look like this is available anymore, but I bought this case for it for $20 and it is nearly perfect.